Melanocytes, found in the basal layer of the epidermis, are the melanin-producing cells that give pigment to the skin, hair, and eyes. When melanocytes develop normally, they have a typical life cycle, that is, their growth is regulated. The occurrence of a genetic mutation (due to DNA damage), can lead to a breakdown in normal behavior and trigger uncontrolled growth. When this happens, it can give rise to a malignant melanoma. Although melanoma it is not the most common form of skin cancer, it is the most fatal. In the United States, an estimated 120,000 new cases are diagnosed each year. Top New York skin cancer experts, Doctors Gary and Kristina Goldenberg have treated numerous cases of basal cell carcinoma, squamous cell carcinoma and melanoma. Because melanoma is one of the more rare and deadly forms of skin cancer, it is absolutely imperative to recognize the signs and symptoms of melanoma early. Like other forms of skin cancer, melanoma is mainly caused by overexposure to ultraviolet light (UV), which is found in sunlight and tanning beds. Fair skin, frequent sunburns, having a large number of moles, as well as a family history of melanoma can be risk factors. However, UV light is not the sole cause of melanoma and cannot account for growths found in areas of the body that are not exposed to sunlight. In these cases, some other contributing factors, such as a compromised immune system and family history of melanoma, are likely at play. Cellular function can be adversely affected by other environmental risks. (A) Asymmetry. Melanomas and atypical moles are asymmetric, meaning that the two halves will not match. (B) Border. The borders of melanoma are often irregular. If the edges of a mole have uneven or jagged, it could indicate melanoma. (C) Color. Uneven distribution of color and variety of colors can be a warning sign. 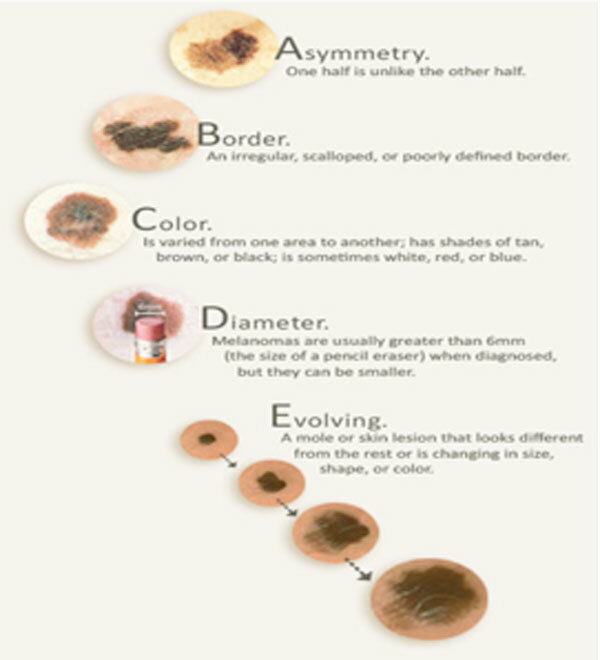 Melanomas can appear in different shades of brown, tan or black and can change to red or blue. (D) Diameter. Lesions greater in size than 6mm (about ¼ inch) can be suspicious. (E) Evolving. If the lesion shows any change in size, shape, color or any other characteristic and/or if it becomes elevated and/or if it becomes symptomatic, it may be deemed suspicious. Prompt diagnosis and treatment is the key to preventing the advancement of melanoma. When removed in its early stages, melanoma has a higher cure rate. Unfortunately, once it spreads to other parts of the body, melanoma is difficult to treat and becomes a serious, potentially fatal disease. Treatment options depend on the size and stage of cancer. Treatment for early stage melanoma. For early-stage melanoma, surgical excision is the standard of care. During the procedure, the abnormal tissue is cut out entirely, as well as a border (called the margin) and sublayer of healthy tissue. Surgical ecisions leave scars, although they can be minimized by good surgical technique and later treated with laser, such as FRAXEL and/or V-BEAM. If the melanoma is caught early enough, this may be the only treatment necessary. A lymph node biopsy may or may not be necessary, depending on the depth of melanoma invasion. Treatment for malignant melanoma that has spread. Several breakthroughs have occurred recently in the treatment of metastatic melanoma. Our doctors will work with your oncologist and continue to screen you for recurrence or development of new disease. Our board certified dermatologists and top dermatopathologist recognize the signs and stages of melanoma, and understands the clinical and emotional implications of melanoma diagnosis. If you notice a suspicious lesion, or have not had an annual dermatology screening, contact our doctors in NYC for a consultation as soon as possible.